Anything you want to call this is probably fine. It’s dusty rock’n’roll, or alternative country twice removed. Or it’s some kind of dislocated Heartland jangle blended with pathos, power pop and Peter Rowan. Indeed, Rowan liked the music. Ask him and he’ll tell you. The bluegrass legend sang with Mack Linebaugh and added his distinctive mandola to Receiver’s “Rise Above the Wreckage,” a song whose title is plainly appropriate for a band that has gone in a year’s time from an upstart Nashville quartet with a critically acclaimed self-titled album to a battle-scarred duo with a highly developed stubborn streak and an even better album. Reasons for the crack-up and restructuring were multifold, predictable and somewhat acrimonious. The short story is former drummer Sean R. Keith became a father and wanted to get off the road. Former bass man Brian Ray had creative issues. Both of them contributed to Receiver. Neither will appear on tour with the band. Want more biography? Okay. Linebaugh, a Nashville native and Hillsborough High School Class of ’88 graduate, grew up on R.E.M, Neil Young and Bruce Cockburn. He developed an early and ultimately temporary disdain for the country music his father enjoyed. McLaurin was born and reared in the flat, sandy Pee Dee region of South Carolina. He left Clemson University in the mid-1980’s, moved to Nashville without a job, and found touring gigs playing acoustic and electric guitar, lap steel, bass and/or mandolin with Vassar Clements, Maura O’Connell and Iris DeMent. Then, in 1995, Linebaugh, Ray and Keith formed Farmer not so John. Further direction was established when McLaurin sat in on a practice one afternoon and joined that evening. The band secured a record deal with Compass, McLaurin produced the debut disc, publications from USA Today to Guitar Player took appreciative notice, and the group hopped in a van and began a year of bush league touring in hopes of giving legs to some major league songs. One continuing annoyance was the insistence of some club owners to pair Farmer not so John with rockabilly, hillbilly, and psychobilly bands, as well as other combos of the retro-roots persuasion. 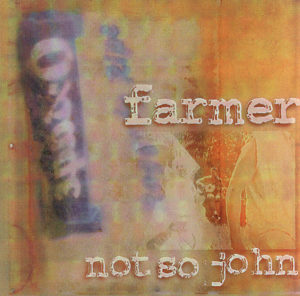 The reason for the ill-conceived double bills was a misperception that Farmer not so John was an alternative country band. Linebaugh says this is mostly McLaurin’s fault. Actually, McLaurin says there are three traditional country grooves and 1 1/2 country progressions on Receiver, though he won’t reveal their precise locations. The rest of the album is both a furtherance and a departure from the debut disc. We’ll skip the other “The Making of Receiver” inside-the-studio type stories, but you’re welcome to ask Mack or Richard about exploding amp cabinets, candle-lit drum booths, canine interruptions or vocal tracks marred by glancing blows from projectiles. You may also pose the “What was it like to work with…?” question as it pertains to special guest pals Rowan, Clive Gregson, Matthew Ryan, Daniel Tashian and Sean Ray.